Mustang is the sweeping story of the wild horse in the culture, history, and popular imagination of the American West. It follows the wild horse across time, from its evolutionary origins on this continent to its return with the conquistadors, its bloody battles on the old frontier, its iconic status in Buffalo Bill shows and early westerns, and its plight today as it makes its last stand on the vanishing range. With the Bureau of Land Management proposing to euthanize thousands of horses and ever-encroaching development threatening the land, the mustang’s position has never been more perilous. But as Stillman reveals, the horses are still running wild despite all the obstacles, with spirit unbroken. DEANNE STILLMAN is the author of Twentynine Palms, a Los Angeles Times bestseller and one of its Best Books of 2001. Hunter Thompson called it "a strange and brilliant story by an important American writer." Her work appears in various publications, including the Los Angeles Times, Rolling Stone, and Slate. She lives in Los Angeles. "A fascinating narrative with all the grace and power embodied in the wild horses that once populated the Western range by the hundreds of thousands . . . [A] magnificently told saga." “Powerful… Stillman’s talent as a writer makes this impossible [to stop reading], to the mustang’s benefit." "A circumspect writer passionate about her purpose can produce a significant gift for readers. Stillman's wonderful chronicle of America's mustangs is an excellent example." "Brisk, smart, thorough, and surprising." 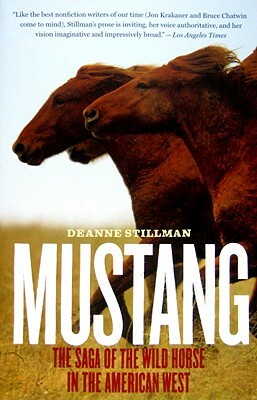 "Stillman's work is a must-read, a must-know, and a call to action for all those who hope to save the American mustang."